January 6 Winners all round! After months of speculation, Jared and Genevieve's engagement is confirmed. Supernatural wins for Best Sci Fi/Fantasy Show at the People's Choice Awards, beating LOST, Heroes, True Blood and the Vampire Diaries. CW video congratulating Supernatural on their win. 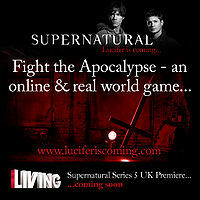 LivingUK launches Fight The Apocalypse - an 'alternate reality game' to promote Season 5 of Supernatural airing in the UK. The prize is a chance to appear on Supernatural. CW boss Dawn Ostroff says Supernatural creator Eric Kripke is warming to the idea of a sixth season. Supernatural writer Jeremy Carver and his wife Anna Fricke will write the US adaption of "Being Human"
In response to the Haiti earthqauke on 12 January 2010, Superantural fan pinkfinity set up help_haiti on Livejournal, a pan fandom effort to auction fan services and raise money. Misha Collins sets up a donation site for UNICEF relief efforts. Jared and Jensen have strengthened their friendship on and off screen since the show began. Is that ideal in a season like this, when the bros are in a weird place emotionally and we know a little more about their connection with Lucifer and the angels? We’re really lucky to have the two of them. As actors, they have such a comfort and respect and almost a shorthand with each other at this point, so they can just jump right in and really try some things that are a little edgy or different in terms of conflict and anger. They feel comfortable going to that place because they work together so well, and they know the other person can carry a heavy load. There is a lot of meta humor involved, such as when the Winchesters go to a Supernatural fan convention or the knowing look Sam gives when House of Wax is mentioned. How do you balance that with the serious story at hand, and has it gotten easier over the years? I would say that we’re probably pulling back on it from now on. My own personal feeling is we’re riding the hairy edge of just starting to go to that well too often and push it too far. Most of the time, we do it reasonably well. It’s a way to poke a little fun at ourselves and wink to the audience that we, as the writers of the show, don’t take ourselves too, too seriously. There’s nothing worse than self-important horror. At the end of the day, you’re in the business of scaring people and saying “Boo!” and ripping their hearts out and spraying blood on the screen, so to say that somehow I’m telling some epic religious story is a little pompous and disingenuous. We like to puncture that balloon, poke fun at the show and have a really healthy sense of humor about the characters and about ourselves. Well, the trick is to not go big but go intimate – at least those are the initial conversations we’ve had [if the show is picked up for a sixth season]. We always set up this five-year storyline, because in my heart of hearts, I just never imagine we’d actually go five years, much less beyond. We are going to climax the storyline and really wrap up the story of Satan and Michael and the apocalypse. The big question is, how do you follow that? We look at this as a unique challenge but also an opportunity to really launch a new storyline next year. We’re almost looking at it as the sequel to a movie. Rather than as a lot of genre shows do as they get on in years, becoming so convoluted and almost collapsing under their own mythology and getting to the point where you just can’t follow any of it anymore, we’re really looking forward to the opportunity of just sweeping it all clean and starting over with something else. We talk about returning to a stripped-down version of the show that’s almost similar to season one, in which the mythology was just as simple as finding their father and finding something that’s really personal and meaningful to Sam and Dean. One of the things that’s hard about the end of the world is sometimes it’s hard to have your characters emotionally connect with it, because it’s so big. But if their emotional storyline for, say, season six is to save a loved one, then that’s something you can really understand and get behind and actually have some really emotional storytelling that takes you through a lot of the scary episodes. The first issue in the third series of Supernatural's comics Beginning's End 1 is published. Cinema Spy says an "unnamed source in Vancouver" hints that Supernatural has been picked up for a sixth season. It is revealed that Jared did audition for the role of Conan in the new movie by director Marcus Nispel, but it has gone to Stargate: Atlantis alumni Jason Momoma. 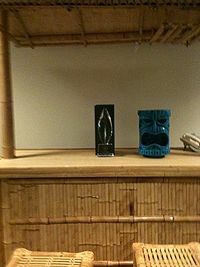 Eric Kripke donates his nomination gift from this years' People's Choice Awards, where Supernatural won for best Sci-fi show, to raise fund for Haiti through an auction run by Support Supernatual. News item on the auction. 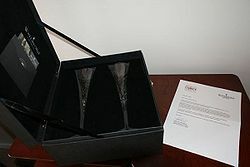 The flutes sold for $2,325.00. January 24 Who ya gonna call? It's announced that in March 2010, ten Ghostfacers webisodes will be produced Source. More information from Variety. 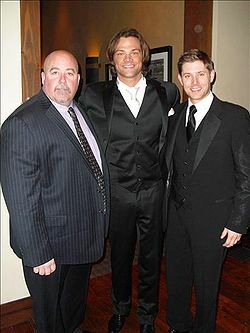 In January 2010, Jensen and Jared's bodyguard Clif Kosterman joined the Twitterverse and started working to expose frauds. On the 27th Jared and Jensen posted a video via the fansite Winchester.com, confirming they are not on any online social media. This was prompted by stories of fans being lured into meeting with people posing as them through Twitter. Jensen, Jared and Misha feature in a CW promotion to raise money for Haiti. January 30th Supernatural 100th episode party !!!! A party is held in Vancouver to celebrate the start of filming the 100th episode of the show. Entertainment is provided by a band called "The Impalas" made up of crew members including Jensen on vocals and Bob Singer on harp. Supernatural wins Best TV Show at the SFX Sci-Fi Awards 2010. Click here for Misha's video acceptance speech. February 10th I'm Batman... or you know the other guy." Genevieve Cortese posted a video via the fansite Winchester.com, confirming she does not have a twitter account. February 18th SUPERNATURAL CONFIRMED FOR A SIXTH SEASON. Following months of speculation and rumours, it is confirmed that Supernatural will return for a sixth season on the CW. Excitment at the news saw Supernatural reach #5 on trending topics on Twitter. Michael Ausiello reports that both Eric Kripke will step aside as show runners to devote more time to new projects with the WB. Sera Gamble is promoted to showrunner. Ausiello reports a source saying: “Eric and Bob will be working very closely with Sera. They are not abandoning the show." "Please tell the fans that the writers say thank you! We so appreciate the We so appreciate the support." Jared had his bachelor party in Vegas this weekend at LAVO inside The Palazzo. After the weekend, Clif Kosterman tweeted "Vegas was fun...no one died....at least there were no bodies around....just kidding...remember to laugh. ( really no one died ok )"
Jensen's name had been mentioned through much of 2009 in connection with the upcoming "Captain America" movie - although Jensen had denied he was in the running at Salute to Supernatural Vancouver 2009. Around late February 2010, a number of articles appeared suggesting he had been "on a short list" but was now out of consideration due to scheduling conflicts. February 27th Jared and Genevieve wed in Sun Valley, Idaho. Clif Kosterman tweeted after the weekend "It was a beautiful ceremony in a beautiful setting." The wedding features in celebrity bride guide. Airport paparazzi in Vancouver snap Jensen with Icarus, and Jared with Genevieve. In an interview done at the 100th episode party Ben Edlund sums up how resolving the Apocalypse "Everything hinges on these two beautiful men and the caprices of their decision making process". TV.com profiles different fan bases and gives Supernatural fandom crazy rating of 10 out of 10 mainly based on our love of Wincest, Crack and drinking. "They are really great guys, a lot of fun and very professional. "They are both very funny in real life... they did have us in stitches on more than one occasion! They sort of riff off each other, it's quite interesting." He added: "They seem to be a perfect pairing in terms of casting, and seem to do a lot together, even getting married at around the same time! It's an interesting scenario, but I guess that tends to happen if you like the person you're working with and you've been working with them for about five years basically daily and for long hours." March 17 From Misha, with love. Backstory: Misha was associate producer on a documentary called "Loot". You can read/see Misha talk about it here. He later tweeted that if anyone went to see the film when it screened in New York they would "be rewarded". Misha is true to his word - he sent chocolates he made himself, with a letter.Obviously aware of the axiom "pics or it didn't happen" he included photos of himself baking Source. First time Con goers Kurt Fuller and Mark Pellegrino delight fans with their entertaining panels. Jensen and Jared are hot and hilarious. March 31 Supernatural finishes filming the fifth Season. The first Supernatural Convention held in a non-English speaking country, Jus In Bello turns out to be a great success. "I've worked a long time in this area, and we're like marching full bore into territories that have, I think, in my experience, generally been off limits. And I would say that Kripke, he's dedicated to a kind of courageous TV making." This thing is like a volcano," Edlund said. "It's trying to keep our heads straight as we march further into ... We're trying to keep it dramatic, accessible and emotionally connected while walking further and further into the mechanics of a universe. I mean, we have angels and demons, and we're talking about that. We have characters looking for God, literally looking for God! So the challenge is to somehow navigate all of this stuff with the same kind of semi-naive popcorn-movie [style] to keep it from being pretentious. How can you do a portrait of the entire cosmological workings of the universe AND keep it at a Saturday matinee level of enjoyment? That is a challenge." April 9 Son of a ... Castiel is reported as the top trending name for baby boys in the US. In the 31st Young Artist Awards, Colin Ford wins for "Best Recurring Young Actor 13 and Under". Also nominated for their guest roles were: Cainan Wiebe who played Barry in 4.13 After School Special and Dalila Bela who played the girl with the tooth fairy in 5.06 I Believe the Children Are Our Future. April 15 100th Episode Celebrations Variety Magazine publishes six articles to celebrate the 100th episode of Supernatural 5.18 Point of No Return which aired on April 15th. The cast and crew had celebrated back in January at the 100th episode party when the episode was filmed. "What co-showrunner Bob Singer and I realized early on was that while the viewers enjoyed the scares, they were tuning in because of how three-dimensional Jared Padalecki and Jensen Ackles were making the Winchester brothers," says Kripke. "So we focused on what creatures would make the brothers' inner demons external. And we expanded their mythology into this massive universe of angels and demons and everything in between, where a battle for Armageddon takes place."" In season four's "The Monster at the End of This Book," the Winchester brothers found they had a colorful fan following because their lives were documented in a collection of books by a prophet. How did fans react to these spoofs of their behavior? As with other episodes, some called Mr. Kripke a genius while others cursed his name. Either way, Kripke remembers how excited he and executive producer Ben Edlund got when given the chance to turn fan feedback around. "It allowed us to make fun of ourselves," Kripke says, "to parody some of the more absurd elements of the show -- which, believe me, we're aware of -- but also gave us a way to let our main characters see their lives from a new angle, from the point of view of the fans themselves." Despite the ongoing presence of angels and demons, what you won't hear in "Supernatural" are the religioso musical cliches from horror films, such as choirs chanting in Latin. "Eric wanted it to be spiritual without ever feeling traditionally Roman Catholic," says Lennertz. The occasional comedic moments provide a little respite from the darker, more dissonant sounds, and those are done "in a very tongue-in-cheek style," adds Lennertz. "We tip the hat to the classic rock that Dean loves so much, with a little distorted guitar, old rock organ, things like that." It's meaty but without being overly complicated. For a certain subset of ambitious dramas, having a Byzantine mythology is a point of pride. One of the pleasures of "Supernatural" is the way it constructs long-term stories without allowing the show's mythology to become off-puttingly complex. The biggest questions within each season are answered in a timely way, and it's possible to sum up the show's premise for newbies in a couple of sentences ("Two brothers hunt supernatural critters, and despite their best intentions, they accidentally started the Apocalypse. Whoops.") Yet those who've watched the show for years appreciate the carefully constructed callbacks to Winchester family history, which is the emotional core of the show. "We're embarking on a whole new adventure as far as the show goes," he says. "With this season's finale, we're coming to the end of a five-year arc, and now we're in a unique position to be able to hit the reset button and take the characters on new adventures, which I think is interesting." Padalecki agrees. "I'm looking forward to exploring where things go." The Ghostfacers Web Series premiered on the CWTV website. The series is produced by Wonderland Sound and Vision in association with Studio 2.0 and Space Zombie Films and produced by Patrick J. Doody and Chris Valenziano. The series is written by A.J. Buckley, Patrick J. Doody, Chris Valenziano, and Travis Wester. Following the two episode launch on April 15, two additional episodes will be shown each Thursday for the next four weeks, for a total of 10 episodes. Unfortunately the webseries was geo-blocked to viewers outisde the US, but the full series was included on the Season 5 DVD. Jensen joined Danneel on the red carpet for the premier of "The Back Up Plan", in which she has a role. More pictures. Misha Collins tweeted from 9:00-10:00pm ET. on May 6 during Supernatural’s 5.21 Two Minutes to Midnight. true to form Misha, who was in Sydney in ahead of the All Hell Breaks Loose 2 Sydney/Melbourne 2010, did it in his Twitter persona. You can read his hilarious tweets here at Misha on Twitter. May 4 From TV Guide via Digital Spy. In an article about the possible fall lineup for The CW, Variety magazine postulated that Sueprantural may be held over for a mid-season start i.e. March 2011. Thankfully the rumour proved untrue. Jim Beaver, Misha Collins, Samantha Ferris, Rob Benedict and Julie McNiven headed downunder for one day conventions in Sydney and Melbourne. In the lead up to the Season 5 finale, Jensen talked to the Toronot Sun] about the past 5 seasons, and looking forward to the sixth. what really has kept people coming back is the relationship between these two characters. And once we found our audience, they couldn’t take us off the air. Heck, any series lasting six years is a heck of an accomplishment. Ackles — a native of Dallas whose notable previous roles were on Smallville, Dawson’s Creek and Days of Our Lives - understands how fortunate he is in that regard. “I was just talking to Josh Jackson (currently of Fringe) who did six years on Dawson’s Creek,” Ackles said. “He goes, ‘You are moving into your sixth season (on Supernatural), aren’t you?’ And I did the sixth season of Dawson’s Creek with him. 5.22 Swan Song, the Season 5 finale airs marking the end of Kripke's originally envisoned five year mytharc and Kripke stepping down from the role of showrunner. We knew we were returning for another season well before Eric [Kripke] sat down to write the finale. So, the episode you saw was the story he worked on from the beginning. As for whether or not the episode resembles Eric's vision of the series finale, had the story ended there ... this is a great question for someone to ask Eric. I'd feel weird speaking for him about what was in his head. In an interview with a Brazilian magazine Jensen talks about where the Season will pick up, hinting that it would involve a leap forward in time. he also mentioned for the first time that he would direct an episode in the season. I didn’t ask for it, which made the whole thing even better. There wasn’t a negotiation, no agents; it was recognition from the crew to my interesting and ideas. They notice because of my active participation on the scenes, sometimes, even helping to direct when we were given the opportunity. If one of the directors asked me what we would like to do, I’d always suggest something related to positioning, camera’s angle and movements to have intensity on the scenes. That helps to give more speed to the whole process and it works. When I got the invitation, I felt awkward and really surprised! A lot of people want to direct on Supernatural. Staffers at SFX Magazine are very impressed when columnist Jayne Nelson receives a thank-you letter from Misha Collinsfor sending him the recent issue of SFX containing her interview with him. Jim Beaver speaks in an interview with Popstar about the last five seasons and looking forward to the sixth. Asylum 4 2010 took place in Birmingham, with Jim Beaver as the main guest. Presumably still nursing hangovers from their weddng on Saturday, Jensen and Danneel arrived in New York on Sunday afternoon. Danneel, who stars in a new NBC series called "Friends With Benefits" in order to attend the NBC Upfronts the following day. Photos: Arriving in NYC, the streets of NYC, at the Upfronts. Supernatural is confirmed as returning in September for it's sixth season, with a move to Friday nights to 9pm, after Smallville. 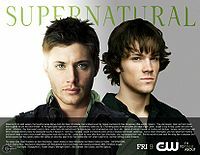 Supernatural originally aired on Tuesday nights on The WB, before moving to Thursday nights when the CW was formed. And the first official description of Season 6 is released in a press release which also confirmed Misha Collins would continue with the show. The first Asylum-run Convention to be held in Europe features Misha Collins , Jim Beaver, Chad Lindberg Samantha Ferris, Traci Dinwiddie, and Mark Pellegrino. The Con featured a Prank on Misha where fans wore cut out faces of Ellen Degeneres.